There are winding queues everywhere – in earlier days, there would be long queues at Railway Reservation Complex. Strange are the ways of people – in buses, they throw – bags, towels and other articles to book their space. In good olden days, people would go in the morning with bedsheets to reserve space at Chepauk Cricket stadium. Even in Sept., the heat is yet to subside, and the water problem is beginning to show-up; people would keep multi-coloured plastic pots – representing them in the queue. This post is on Lucy Kelly, in Sydney securing third spot in a queue. World is going gaga over the release of - Apple iPhone 6 - in Indian Rupees it would be around Rs.38000/- approx.. iPhone, is a line of smartphones designed and marketed by Apple Inc. They run Apple's iOS mobile operating system. From its first generation release in June 2007, much water has flown – and now comes the recent iPhone 6s and iPhone 6s Plus. The user interface is built around the device's multi-touch screen, including a virtual keyboard. The iPhone has Wi-Fi and can connect to cellular networks. An iPhone can shoot video, take photos, play music, send and receive email, browse the web, send texts, GPS navigation, record notes, do mathematical calculations, and receive visual voicemail. There are nine generations of iPhone models, each accompanied by one of the nine major releases of iOS. Whether you think the iPhone 6s is a major upgrade in the iPhone line or just Apple playing catch up, there are lots of new features and improvements in the company's latest device. Physically, though, the design remains pretty much unchanged. There's plenty of glass on the front to break or scratch, and while the back is a little less delicate, you can still do some damage with a hard enough drop. Scenes of fans camped outside one of London's biggest Apple stores can only mean one thing – a new product from the U.S. tech giant. As it went on sale on Friday, fans braved the cold to get their hands on the latest handset while investors await to see whether Apple's flagship product still has legs. Earlier this month, Apple said the iPhone 6s and 6s Plus were "on pace to beat last year's 10 million unit first-weekend record" in terms of sales, when the iPhone 6 and 6 Plus went on sale in 2014. But the Cupertino, CA-based tech giant didn't crack out the exact figures it is expecting. Regardless of the focus of investors, fans are waiting eagerly for the new phones to make sure they can get the newest colors before the stocks go. The iPhone 6s and 6s Plus will be available in four colors and will be available in 12 countries including the U.S., U.K. and China starting from Friday. A punter, reportedly was queuing outside the Covent Garden Apple store in the heart of London since Thursday evening for over 12 hours, waiting to buy the phone for his mum's birthday. But …. 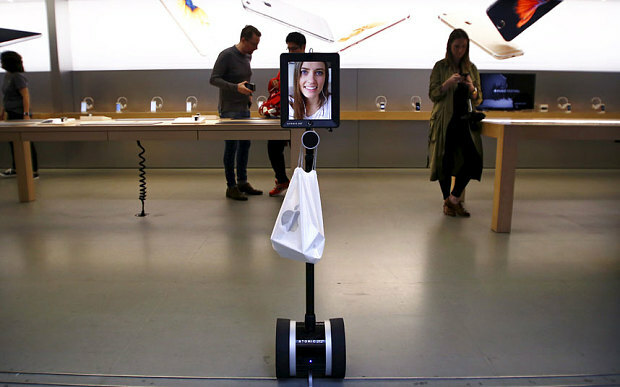 None to beat this woman in Australia – she - sent a robot to wait in line for her.While Lucy Kelly sat at her home in Sydney, Australia, a so-called “telepresence robot” braved the actual lines in front of the Apple Store. The robot sat motionless, plugged into an outlet so that it did not lose power, broadcasting Kelly’s face to the real, actual humans who endured the elements, and slept on concrete, and stared at their soon-to-be-obsolete iPhones for days on end. “Kelly is meanwhile chilling in the warmth of her office,” Mashable reported, “while her robot counterpart stands in the wind and rain…If all goes to plan, the robot will…purchase the iPhone without any human interaction.” Some screamed - Apple cannot let this happen: It should not sell a new iPhone to anyone who sends a robot to wait in line. This is cheating, and cheaters should not be rewarded. Since the iPhone’s official release in 2007, waiting outside for a new iPhone has become something of a tradition: a stupid, meaningless tradition, every time, we read about people huddled up on the sidewalk, sleeping in tents, relieving themselves on streets, creating a general Pigpen-like cloud of stench in the areas surrounding Apple Stores, all in order to purchase a smartphone slightly earlier than they would have if they had ordered one through the internet. Now there is a technological break – a streak of extremism - everyone else in that iPhone line gave up their bodies, and their comfort, and some time at home with their families and their friends and their video game consoles to camp out for an iPhone. The woman sent a robot to wait in her stead gave up nothing, and even got some publicity for her digital agency in the process. iPhones are for humans ~Apple, did not think so – it promptly gave away one to the robot……….. next time, would we see a repeat in – say Queue outside famous schools in Chennai, where people wait for hours to get their son/daughter admitted to Lkg or Nursery !! Remember that at Beijing World Championship, when Usain Bolt was celebrating his win in 200M, there was a bizarre accident with a cameraman straying too close to the barefoot Bolt as he posed for photos following his gold-medal run. 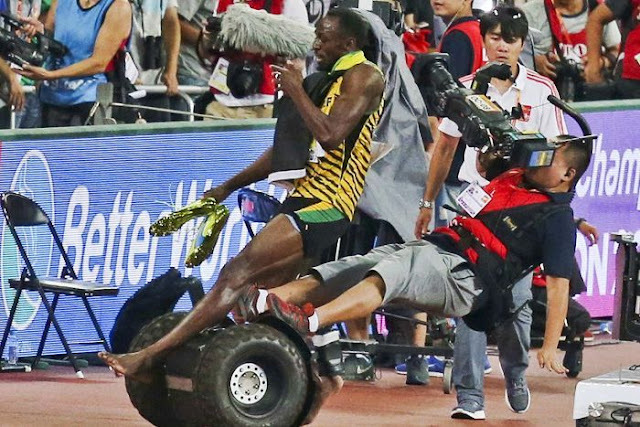 The local television journalist bumped into a fixed railing and went flying off backwards, shooting the Segway scooter into Bolt's legs from behind and sending the Jamaican crashing to the ground. This robot too was placed on a Segway scooter. Excellent blog samp.. keep blogging!